The recent resurgence of interest in mariachi music has led many young musicians to learn to play the traditional instruments and to read music. 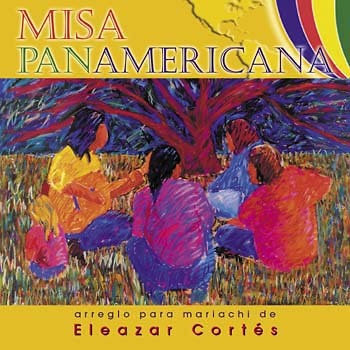 Many have wanted to perform the classic songs in the Misa Panamericana CD. Now, a new arrangement of the most popular Mass setting in Latin America is available in print! In the early 1960s, when the second Vatican Council authorized the celebration of the liturgy in the vernacular, the bishop of Cuernavaca, Mexico, gathered music from Chile, Brazil, Costa Rica, Mexico and other countries, then organized a group of mariachi musicians to learn and perform it at the cathedral there. In this way, the famous and beloved Misa Panamericana was born. Drawing from his own memory and an early live recording, Eleazar has arranged the harmonies and instrumentation to capture the distinctive style of the original version. Arranged for two and three voices, guitar, vihuela, guitarrón, trumpets and violins, and suitable for use throughout the liturgical year, Misa Panamericana will be a welcome and familiar setting for Hispanic assemblies everywhere. Includes: Kyrie, Gloria, Gospel Acclamation, Holy, Lamb of God.